The foodcourts under Koufu have no frills and serve their purpose of feeding the masses. Outlets span from those in malls to those in tertiary institutions, and other foodcourt brands under Koufu include Cookhouse by Koufu, Gourmet Paradise, Rasapura Masters, and Fork & Spoon. Warung K - known for its Indonesia-style charcoal-grilled meats - first started a stall at Pioneer Point in April last year. It was closed shortly after to open at Timbre+ in Ayer Rajah Crescent, followed by 100AM. Order the arang ayam bakar ($7) where the tender chicken has a crisp skin with a lovely smoky aroma, and a sweet and spicy kecap manis glaze. Squeeze the lime over everything, including the divine sambal. Other options include smoked duck ($7), Hokkaido squid bakar ($9) and Lombok steak bakar ($9). Of all the dishes I tried, this is my favourite. Sometimes, an oldie remains a goodie. This applies here as the queues - an average of half an hour - never cease The rojak ($3 to $6) is full of ingredients including crispy youtiao, kang kong, beansprouts, pineapple, turnip and cucumber. I love that there is cuttlefish as well. Opening in 2019: Woodlands Woodgrove opens this month, Buangkok Square by the middle of next month, and Kallang Way in the second quarter of this year. Each foodcourt will have 10 stalls. 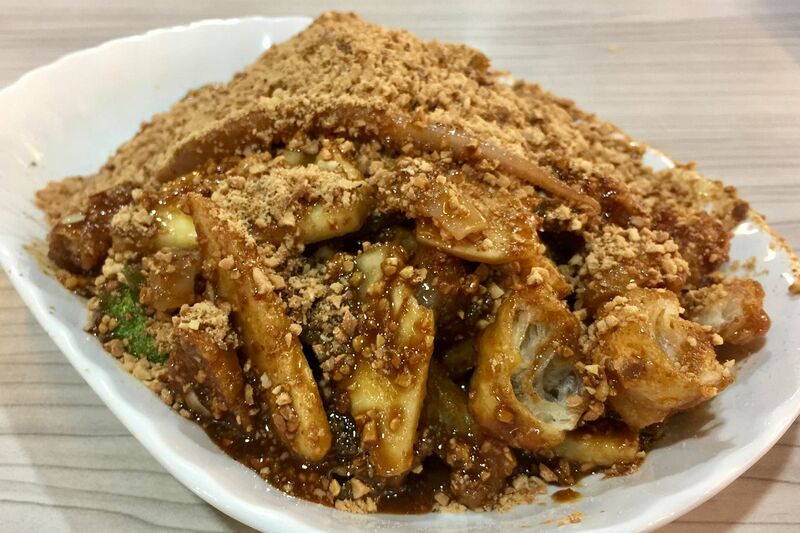 What started out as a hawker stall in Ang Mo Kio serving Asian-infused Western food has now developed a strong following. I go for the signature fish and chips with salted egg sauce ($10.90). The fish is well cooked with a flaky interior and a crisp batter. I like that the salted egg sauce is not overly salty.Other highlights include lemon butter grilled fish ($8.90) and black pepper chicken ($7.90).